Have you ever wondered if your oven has hot spots? While I would never recommend sacrificing these cookies to the cause, cookies can be a great way to discover where the hot spots are in your oven. I recommend buying a roll of refrigerated pre-made cookie dough from the grocery store. Slice the cookies as desired and spread them over a baking sheet. Bake, without rotating or switching racks, for the indicated time. Pull the cookies out and see what cookies, on which part of the baking sheet, have browned more than others; those are your hot spots. Does the thought of sacrificing any cookie for this exercise pain you? I respect that. Use a loaf of white bread instead. Spread bread slices over a baking sheet and bake at 400 for about 8 minutes or until the bread starts to brown. Remove the baking sheet and see what slices are most brown to find the hot spots. Once you know your oven’s idiosyncrasies, make these cookies. And then get ready to make them again. Crisp around the edges and chewy in the middle, these cookies seemingly disappeared overnight. I hope you enjoy them. Happy cooking! When I’m craving the classic version of a culinary favorite, I turn to the Ultimate Southern Living Cookbook. Given to me as a gift when I graduated from college, its spattered and stained pages indicate my approval of the recipes it contains. 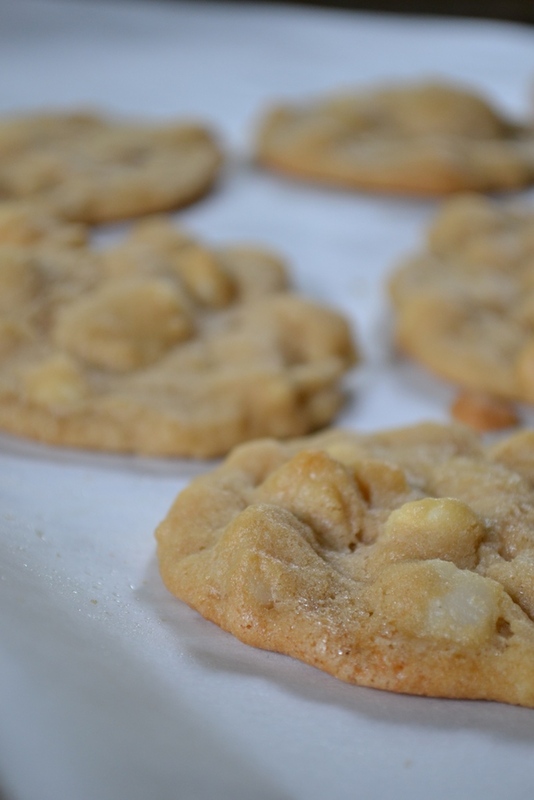 This recipe for White Chocolate and Macadamia Nut Cookies is adapted from the one found in this cookbook. Preheat the oven to 350 degrees F. Line two (or three) baking sheets with parchment paper and set aside. Beat the butter in a large bowl of an electric stand mixer fitted with the paddle attachment. Add both sugars and beat until combined. Add the egg and vanilla extract and beat until incorporated. Whisk the flour, baking soda, and salt together in a medium bowl. Slowly add the flour mixture to the wet ingredients beating after each addition. 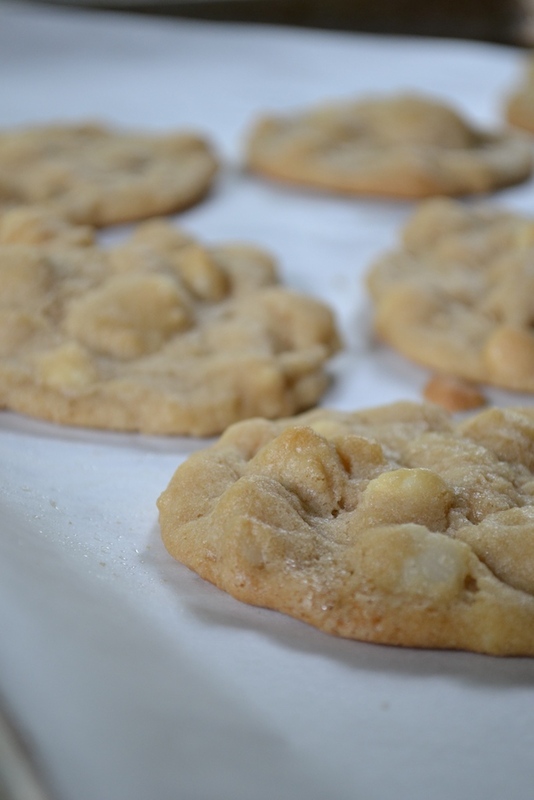 With the mixer speed on low, add the white chocolate chips and macadamia nuts. Using a regular teaspoon (the kind you set your table with not a measuring teaspoon), scoop out golf ball-size rounds of dough and drop them on the baking sheet about 2-inches apart. Bake for about 11 minutes, switching racks and rotating as needed, until they are golden brown around the edges. While it took 11 minutes for my cookies to bake, always check cookies early – it’s far better to have to continue baking then to have burnt cookies on hand. Remove the cookies from the oven. Let cool on the baking sheet for five minutes before moving them to a wire rack. Cool completely (being sure to eat a warm one while you wait – it’s good to be the cook) and then store in an airtight container or freeze for up to 6 months. Kendall, you mean the ones that we use to binge eat prior to Reunion Weekend? Yes, they are very similar and equally irresistible! 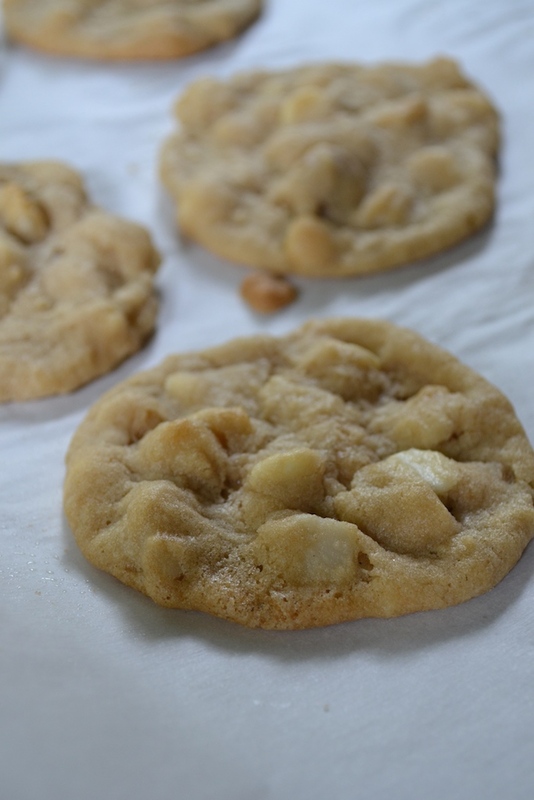 Thank you for posting your White Chocolate and Macadamia Nut Cookie recipe online, I need to try it out sometime when I’m not busy at work. I love macadamia nuts, especially when it’s combined with chocolate! These cookies will definitely disappear overnight, like you described, in my family. You are most welcome! Hope you and your family enjoy them. Happy cooking!